Prominent & Leading Manufacturer from New Delhi, we offer canvas oil seals and rubber oil seals. We take pleasure to introduce ourselves as one of the renowned manufacturers and suppliers of Canvas Oil Seals. We assure that the entire gamut of seals is manufactured at our advance manufacturing unit under the supervision of our qualified professionals. Stringent checks and utilization of high grade rubber have enabled us, achieve total satisfaction for our clients. Our offered products are highly applicable in diverse industries for various purposes. 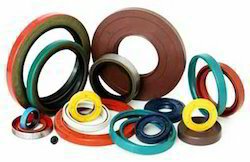 We are the prominent manufacturer, exporter and supplier of Rubber Oil Seals, which are made from optimum quality rubber. Our range of Rubber Oil Seals is widely appreciated by our clients for their qualitative features. These are made from NBR, Neoprene, Silicone, Viton, etc and are used in different various industries.